PURE ALL NATURAL LIP BALM: Organic Sunflower Oil, Organic Beeswax, Organic Coconut Oil, Vitamin E, Organic Rosemary Extract, Organic Calendula and Natural Organic Flavors. NON-TOXIC, NON-GMO, GLUTEN FREE, NO chemicals, NO petroleum or petroleum derivatives, NO fillers and No soy! 100% USDA Certified Organic Lip Moisturizer. Nourishing Lip Butter Perfect for Toddlers, Kids, Dry Lips, Chapped Lips, Cracked Lips, Lipstick base, Gift Sets. Best Organic Lip Balm safe for all ages! 4 RICH FLAVORS OF CHAPSTICK MULTIPACK: Delicious smells, try not to eat them! Energize your lips with our lucious Vanilla Bean, Peppermint, Raspberry and Asian Pear flavored Best Organic Lip Balms. Safe for even the most Sensitive Lips. 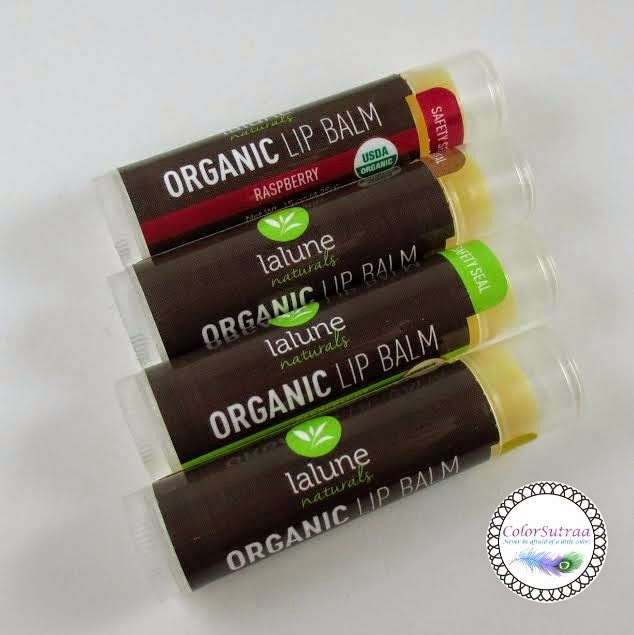 MONEY BACK SATISFACTION GUARANTEE: All of our products at La Lune Naturals come with a Hassle Free Money-Back Satisfaction Guarantee so you can buy our Lip Balm Pack with confidence. IMPRESSIONS : These lip balms feel so good! SO good! They go on smooth and easy and kept my lips hydrated and soft for hours on end. Being organic, it also made me feel good that I was coating my lips, a sensitive part by any standards, with harsh chemicals all day long. But the best part, for me at least, was that one pack has 4 different scents to choose from, so you can switch it up depending on your mood. I tend to be really picky when it comes to lip balm flavors, for example, I HATE the traditional cherry so I really appreciated the options available. My favorite? Definitely the Asian Pear! If you would like to try these lip balms yourself, you can find them in a handy 4-pack on Amazon HERE for the price of $11.99--that's just $3 a pop! Are you obsessed with lip balms? What's your favorite flavor/scent? I'd love to hear your opinions in the comments section below! I love the Lemon & Pomegranate Lip Cream from CO Bigelow for a mainstream balm. My favorite indie balm is Strawberry Champagne from Starlette by Cinema Swatch Lacquers.